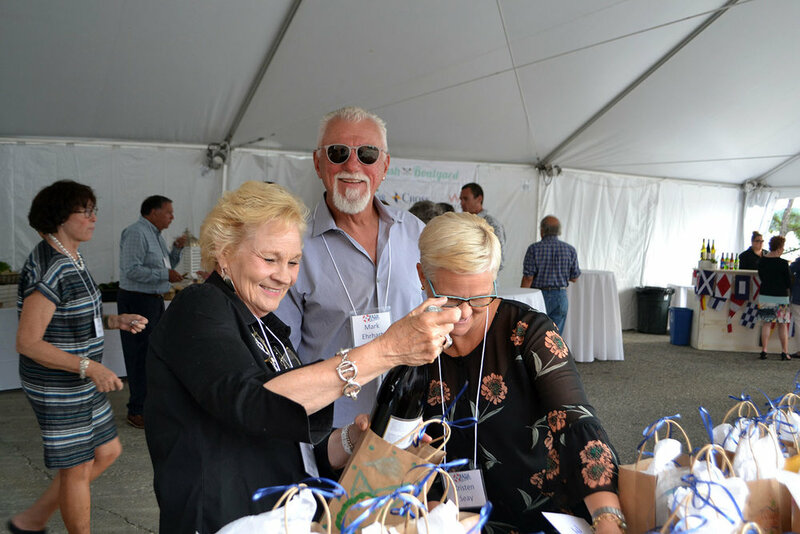 On Thursday, July 12, over 300 guests gathered at Abel's Yacht Yard on Somes Sound for the 3rd Annual Bash at the Boatyard. While the event serves as a fundraiser for The Neighborhood House, it also provides an opportunity to gather and celebrate our community in a fun and laid-back atmosphere. For the third straight year, the party was held on the shore of Somes Sound with idyllic views of the water and western mountains. Mother Nature cooperated as well, providing a perfect summer evening. Guests meandered and socialized both inside and out. The festivities included a mouthwatering assortment of finger-friendly bites prepared by Bar Harbor Catering Company, live music, an amazing silent auction, paddle raise, wine grab, and more! The Wine Grab was a fun new addition to what is already a popular annual event. Upon check-in guests were greeted with a new addition to the Bash-- a "Wine Grab." The concept is simple: for $25, you pick a "mystery bottle" of wine, guaranteed to be worth at least $25, and likely more. Each bottle was selected and generously contributed by a supporter of The Neighborhood House. Meanwhile, the identity of each wine was kept a secret thanks to some colorfully decorated bags from the “resident artists” in our Summer Camp program. Music was also part of the festivities. Mt. Desert Island High School Music Director, Michael Remy, and several skilled young musicians took to the stage. The band kept the evening flowing and certainly added a little liveliness to the affair. Not everyone is lucky enough to call MDI their year 'round home and have the opportunity to enjoy these amazing musicians at various school-sponsored events. The evening gives everyone a chance to listen to and appreciate the strength of the music programs at our area schools. A highlight of the Bash at the Boatyard has always been the silent auction. Our community is teeming with creative talent and philanthropic ideals. If you ever have any uncertainty about that, all you need to do is look at our silent auction. Nearly NINETY local artists, merchants, craftspeople, and private supporters contributed goods to the auction, with some even donating multiple items. The greatest example of this spirit of generosity, however, was the "Fund-A-Need" paddle raise. This year's paddle raise was focused on our Summer Camp program. Fees, grants, and private contributions go a long way towards covering the actual cost of running a high-quality, safe, and (of course) fun program, but that still leaves about a $7,000 gap between revenue and expenses. Luckily, we just happened to have a boat bay full of about 300 extremely generous individuals who, like you, support The Neighborhood House and all of its many year ‘round activities and events. Guest auctioneer Andrew Simon of the Barn Arts Collective took to the mic and quickly explained the lofty goal of raising that $7,000 in just FIVE MINUTES. Now here's what makes YOU so amazing: you didn't just step up to the challenge and help us raise the $7,000. Instead, you pledged more than $12,500! After all the dust settled, the Bash at the Boatyard raised a net total of $41,000 for The Neighborhood House. Your generosity and vote of confidence is unbelievably appreciated. Just as important as that dollar amount are the number of connections we get to form thanks to events such as this. We still have plenty of summer fun on the horizon, so be sure to stop by The Neighborhood House to see what's happening, or just to say hello. We'll look forward to seeing you! It Was an Amazing Evening... and We Have the Pictures to Prove It!